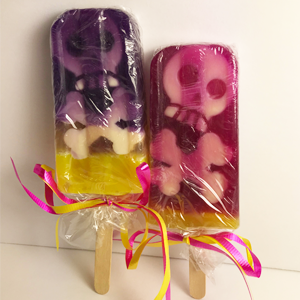 Adorable soap Popsicle with skull design scented in lemonade. Handmade with pure vegetable glycerin, which moisturizes the skin. Soap wrapped individually in clear cellophane. Great for gifts or indulge yourself! Our soaps are handmade in small batches so the designs might not be identical to the photo.